From 2012-2013, Emma was awarded a Project Fund grant from the AHRC's knowledge exchange hub: REACT, and grants from Exeter's Open Innovation fund and from HEIF (totalling £37,250) to pursue links with creative economy partner, Antenna International. Emma worked on a project in collaboration with Antenna to create an iPad App prototype and is now in the process of building a full app. The app aimed to introduce school age pupils and other audiences to the world of medieval manuscripts. Initial funding enabled us to build a prototype based around Exeter Cathedral’s famous Exeter Book (c. 970) which contains the world’s largest collection of Anglo-Saxon (Old English) poetry, and features the Exeter Riddles: a collection of ninety-six literary enigmas. A scholarly web app is also in development in partnership with Elaine Treharne and Benjamin Albritton (Stanford), and Johanna Green (Glasgow), benefiting from the resources of Exeter's Digital Humanities facility. Recently, Emma was a Text Technologies Fellow at Stanford in May 2016 where she worked on the development of the app project. With the REACT-HEIF grant, Emma set up and ran three study days in October 2012 about the Exeter Manuscripts Project in local schools (ISCA College of Media Arts; St Sidwell’s CofE Primary School, and Exeter College, with pupils from years 6-13; and a further day in May 2014 at St Christopher's, Totnes), with Sara Hurley, Story Worker and Community Artist, and Cara Patterson, Visual Artist and Illustrator, both hired through Daisi (Devon Art in Schools Initiative). Pupils helped to design the App, and composed and illustrated riddles inspired by the Exeter Book, which formed part of an exhibition Emma jointly curated in Exeter Cathedral from 23rd October-4th November 2012, ‘From Medieval Manuscripts to Calligraffiti: Discovering Exeter’s Written Heritage’. Emma won a larger grant (£30K in May 2013) from the REACT Project Fund to support development of the prototype app. In addition, Emma won a REACT Exeter Collaborative Doctoral Award in 2012, and jointly supervised PhD student Peter Knowles with Antenna International from 2012-2016. Peter successfully completed his PhD and is now a Content Designer at Antenna. Anyone staying at the Mercure Southgate Hotel in Exeter can currently read about the Exeter Book and Emma's project in information in each hotel room to accompany the hotel's 'Exeter Book' refurbishment in March 2015 which now includes a carpet featuring 'The Wanderer' in the restaurant and riddle 26 in the bathrooms! Emma gave a talk at the launch of the refurbishment of the hotel in May 2015. 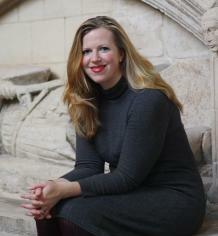 Emma is series editor for 'Material Culture and the Medieval World' at I. B. Tauris; co-editor of the leading subject journal French Studies, and on the French editorial team of MLO (Modern Languages Open Journal). She is Vice-President of the International Courtly Literature Society (2016-); as well as President of the British Branch of the ICLS (2017-); VP and co-founder of the International Alain Chartier Society. Emma was a member of the AHRC’s Peer Review College from 2007-2014. She served on AHRC Fellowship panel D, in May 2012. She has undertaken review and externalling work (most recently for Liverpool), and is currently external examiner for the BA French progamme at the Universities of Leeds, KCL, and Cambridge. Emma is a member of several national and international subject associations: AUPHF (Association of University Professors and Heads of French); the ICLS (International Courtly Literature Society - she served for 9 years as International Secretary), EBS (Early Book Society), Fifteenth-Century Studies, SFS (Society for French Studies), SMMLL (Society for the Study of Medieval Languages and Literature), the International Christine de Pizan Society, the International Machaut Society, and the International Alain Chartier Society. Emma reviews papers/manuscripts for the MHRA critical texts series, and Oxford University Press, as well as French Studies, MLO, Renaissance Studies and Medium Aevum and contributes book reviews to a variety of journals (eg. Speculum, Encomia, French Studies, Medium Aevum). Emma has been involved in a broad range of media activity relating both to the Exeter Book app project, and to her work with local young people on gender, diversity, and identity, upcycling dolls. Recently she appeared on BBC Breakfast (7th November 2016) to talk about her doll project, and regularly provides opinions on local radio on topics that have ranged from Emma Watson's Vanity Fair cover, curvy Barbies, and Dr Who's latest regeneration.